Running wasn’t much joy lately. The normal basic run was kind of ok. It felt a bit tougher but with all the snow around and three layers of clothing when it had -15 to -20 degrees, well, running just isn’t the same than with a pair of shorts on a dry and sunny 20 degrees sunshine day in Central Europe. But then the interval runs, currently done indoors, were out of line. After about 10 minutes all strength was gone and running the efforts became more like jogging. That sucked. After a couple of weeks it was time to see the doc. 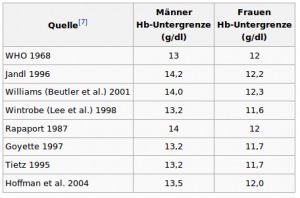 The lab results discovered it, haemoglobin down to 130, iron deficiency. It’s just below the minimum haemoglobin value for men. Depending a bit on what reference values are used it’s a bit closer or further away from the minimum level (see table on the left). The result’s the same, it’s damn tough to keep up a decent training. And with the Hamburg Marathon on the horizon (in 8 weeks), one should gradually get going with those 100+km weeks.